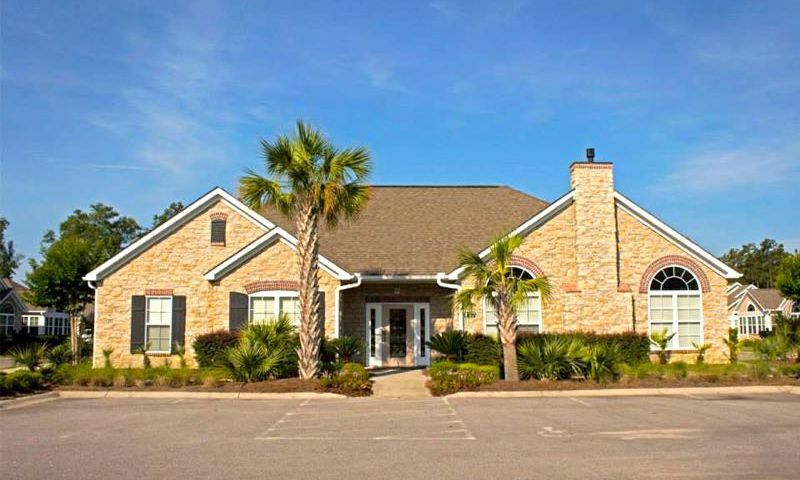 StoneGate at Prince Creek is an active lifestyle community located in Murrells Inlet, South Carolina. This quaint community offers great amenities and low-maintenance homes. StoneGate at Prince Creek is located in a great area with a myriad of shopping, dining, and entertainment options nearby. StoneGate at Prince Creek provides its residents with excellent amenities. The community clubhouse is the center for all activities and clubs. Here residents often gather to play cards, billiards or work out in the fitness room. The outdoor pool is a great place to take a swim or read a book poolside. Summer barbeques and holiday parties are frequently planned and held on the event lawn behind the clubhouse. Started by Epcon Communities in 2003 StoneGate at Prince Creek is slated to build 174 attached and single-family homes. The Courtyard Series offers four attached floor plans ranging between 1,137 and 1,806 square feet of living space. Each model has at least two bedrooms, two bathrooms and an attached two-and-a-half-car garage. Private courtyards offer homeowners a secluded place to relax outdoors or entertain guests. While the Courtyard Series models were designed to be attached quad homes it is possible to build a new construction model as a single-family home. The Cathedral Series offers one attached floor plan. With 1,800 square feet of living space this model has two to three bedrooms, two bathrooms and a two-car garage. A great feature of this model is the Carolina Room which is an all seasons room great for reading the morning paper. All homes in both collections offer great low-maintenance living. Now, new construction single-family homes are being built by Flagship Construction. There are seven models in the Garden Homes collection that offer 1,301 to 1,974 square feet of heated living space. These one-story homes have three bedrooms, two or two-and-a-half bathrooms, and an attached two-car garage. Detached homes are a great option that are still low-maintenance yet offer a bit more privacy. Many homebuyers are attracted to the low-maintenance lifestyle offered in StoneGate at Prince Creek. An annual homeowners' association fee covers all maintenance of the community grounds, amenities, and exterior care of the homes. This low-maintenance lifestyle allows residents the opportunity to focus more on what they want to do and less on everyday chores. StoneGate at Prince Creek is located in the beautiful Myrtle Beach area where residents enjoy endless opportunities for shopping, dining, and entertainment. The Coastal Grand Mall is a great place to find the best in retail stores and dining options. Just off Ocean Highway residents have easy access for travel up and down the coast. With coastal beaches less than 20 minutes away residents often plan relaxing day trips to the beach and golfers love the numerous private and public courses in the area. With beautiful weather all year and so many things to do there is no wonder why the Myrtle Beach area is one of the most sought after areas. StoneGate at Prince Creek really has it all for discerning homebuyers in South Carolina. Check back soon for more information on the lifestyle in StoneGate at Prince Creek. New construction homes are being offered in seven single-family home models. The Garden Homes collection by Flagship Construction offers between 1,301 and 1,974 square feet of heated living space. These single-level homes include three bedrooms, two or two-and-half bathrooms and an attached two-car garage. The Courtyard Series offers four attached floor plans ranging between 1,137 and 1,806 square feet of living space. Each model has at least two bedrooms, two bathrooms and an attached two-and-a-half-car garage. Private courtyards offer homeowners a secluded place to relax outdoors or entertain guests. While the Courtyard Series models were designed to be attached homes it is possible to build a new construction model as a single-family home. The Cathedral Series offers one attached floor plan. With 1,800 square feet of living space this model has two to three bedrooms, two bathrooms and a two-car garage. A great feature of this model is the Carolina Room which is an all seasons room great for reading the morning paper. StoneGate is a very nice community. Everything is really well maintained and you can see the pride of ownership. It's nice to live in a small neighborhood where everyone takes good care of their homes. It's nice having all the outside work taken care of by the HOA so we have more free time to enjoy the community and the Myrtle Beach area. We love it here! 55places.com is not affiliated with the developer(s) or homeowners association of StoneGate at Prince Creek. The information you submit is distributed to a 55places.com Partner Agent, who is a licensed real estate agent. The information regarding StoneGate at Prince Creek has not been verified or approved by the developer or homeowners association. Please verify all information prior to purchasing. 55places.com is not responsible for any errors regarding the information displayed on this website.